Robert E. Nabours, Ph.D., P.E., Raymond M. Fish, Ph.D., M.D., F.A.C.E.P., and Paul F. Hill, Esq. Electric currents and electromagnetic radiation, both ionizing and nonionizing, can produce harmful biological effects in humans; these effects are the subject of an ever growing number of lawsuits. This book provides an introduction to the biological effects of electric currents and EMFs and the state of engineering and medical knowledge as we approach the twenty-first century. Part I explains what forensic electrical engineers do and how they can assist attorneys in handling electrical injury cases. It also covers electrical codes and standards, basic electrical systems, and reconstructing the electrical accident. 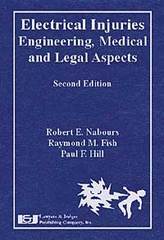 Part II covers the medical aspects of electrical injuries, including the consequences of electrical injury on the body, EKGs and pacemakers, accident reconstruction in electrical injury cases, common sources of electrical injury, and relevant medical literature. This section also explains how electrical impulses control and influence muscle cells throughout the body as well as the pumping of blood throughout the heart.